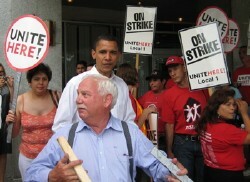 Organized labor provided unprecedented backing to Barack Obama this fall because activists believe he “walks the walk” rather than simply “talks the talk.” Case in point occurred in Chicago on June 16, 2007, when Obama joined a UNITE HERE Local 1 picket line at the Congress Hotel. The Congress strike began in 2003, and is the nation’s longest. After walking the line (see video here) Obama vowed to return to join the striking picketers after he was elected President. Will Obama become the first sitting President to walk a picket line? Should labor activists push him to keep this pledge, or should it use it as leverage to help secure systemic changes? The Congress Hotel strike is not the only labor campaign Obama has weighed in on – in September, he lent momentum to the campaign for free and fair union elections at California’s St. Joseph Health System, saying the hospital workers there were standing up for “American values.” As some criticize Obama’s commitment to change, it is in his fulfilling of promises to labor that may be the best test of his progressive credentials. My new book discusses UNITE HERE’s Congress Hotel strike and boycott, among the many examples of the union’s bringing the tactics and strategies of the UFW grape boycott into the Age of the Internet. Barack Obama joined the picket line on the fourth anniversary of the dispute on June 16, 2007, and, as Chicago faith-based labor activist C.J. Hawking recently reminded me, pledged to return to join the picketers after being elected President. Obama’s public commitment to join UNITE HERE’s picket line has not gotten much public attention. And I cannot even imagine former Democratic Presidents John F. Kennedy, Lyndon Johnson, Jimmy Carter, or Bill Clinton on a union picket line in a labor dispute. But if you watch the video linked above, you will see that Obama looks and sounds like the community organizer he once was. He seems right at home among the strikers. Labor’s top priorities are universal health care and the passage of the Employee Free Choice Act (EFCA). Immigration reform is among the top priorities of SEIU and UNITE HERE, but action on this far more controversial issue will begin no sooner than next summer. Labor unions have fought for universal health care for decades, and it is already clear from Obama’s appointments of Rahm Emmanuel, Tom Daschle, and Peter Orszag (head of OMB) that the President-elect will be moving on healthcare from day one. In fact, expect Congress to pass and Obama to sign the State Children’s Health Insurance Program (SCHIP) bill (vetoed by George Bush) early in his presidency. Obama can use the health care campaign to partner with his labor allies, and to maintain enthusiasm among his base. SEIU will soon begin a 100-day campaign to build support for universal health care, and other unions will play key roles in an effort that will combine the Internet, grassroots outreach, and other election-style campaign tactics. The United States is not only the only industrialized nation without universal health care; it is also the only such country whose labor laws are designed to prevent unionization. The fact that only 7% of private sector workers are unionized is a function of many factors, but among the biggest is that federal laws encourage employer tactics that prevent unions. Wal-Mart and other non-union employers like our labor laws just as they are, and describe EFCA in doomsday terms. Defeating the measure is corporate America’s top priority for 2009, and while Obama and top House and Senate Democrats are committed to EFCA, the Senate may not have a filibuster-proof majority for the bill. The strategic question is: how many political chits should labor give up to pass EFCA, given that passage is not assured and that an all-out effort that ends in public defeat would tarnish labor’s political clout? While labor leaders remain publicly committed to passing EFCA at all costs, there are incredibly important labor law reforms short of EFCA that would significantly increase union membership. These reforms include: a shortened time span (such as seven days) between the submission of a majority of worker cards favoring unionization and the holding of an election (which would limit the time employers have to influence workers), much harsher penalties for unfair labor practices, and binding contract orders when employers, as in the case of the Congress Hotel, avoid bargaining in good faith. California’s Agricultural Labor Relations Act (ALRA) could be a model for the type of changes needed in federal law, and most of the necessary reforms could be done administratively. This would allow labor to save its congressional chits for other priorities, including immigration reform and a higher and indexed federal minimum wage. Of course, winning administrative changes requires Obama to appoint a pro-union National Labor Relations Board. This is the area, rather than the highly publicized Treasury or Secretary of State posts, where Obama’s commitment to progressive principles will be most on display. Recall that Bill Clinton appointed the progressive William Gould IV to be his first NLRB head, and then fired him because employers argued he was too pro-union. Organized labor expects Obama to take a different approach. Although the New York Times reported over the weekend that David Bonior was the frontrunner to be Secretary of Labor, my sources tell me he has removed himself from consideration. Congressmember Linda Sanchez was formerly a candidate, but her recent announcement that she will soon be in labor as a single mother may not give her the time to do the job. The cabinet post of Secretary of Labor is more high profile than the NLRB head, but it is the latter that can make the administrative changes to even the playing field for union organizing. I think UNITE HERE will give Obama a public pass on his picket line commitment, citing security considerations. But nobody in labor will give Obama a pass on his NLRB and other union-related appointments, and everyone I talk to in the labor movement has confidence the new president will deliver.